Motor Start and Run Capacitors available with us. CONCAP brings superior quality Motor Start Capacitors manufactured with MPP Film technology replacing conventional Aluminum Electrolytic Motor Start Capacitors. - Minimal dissipation factor leading to much higher reliability. Chances of failures are minimal. 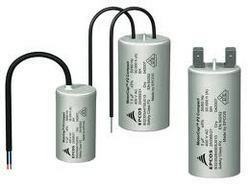 motor start capacitors; Capacitors is particularly designed to meet the needs of an AC as well as Motor Run Application. available with single terminal for single cane and wire for double alluminium cane suitable for soldering or push on receptacles.